Dark Politricks: Can the Pentagon Attack finally be solved? Is The Pentagon Attack Finally Solved? I recently wrote a piece called the Pentagon Attack which contained a number of videos. However it also contained a number of questions related to the 9.11 event as a whole. This article is a summary containing the events regarding the Pentagon attack alone. If you have the time I suggest you watch all these videos, as together they can be used to make a reasonable conclusion about what really happened at the Pentagon. Even if the first documentary has one conclusion please watch the second talk as it will explain the evidence piece by piece and can be used to explain why the first documentary comes to it's conclusion. Why is the Pentagon Attack such a point of contention? 1. The conflicting witness accounts. Some witnesses claim to have seen a plane fly over the building, some into it. Others claim to have heard the explosion first and then seen a plane in the sky. 2. The physical evidence. Some witnesses and photos show a clean front lawn outside the official impact zone. Other photos show plane debris. Witnesses claim to have walked through the holes in the wall and to have not seen any evidence of a plane at all. 3. Pilots and aircraft experts claim that the manoeuvre made by Nawaf Hazmi, the alleged terrorist, was too complicated and fast for even expert pilots to have made let alone an amateur with poor piloting skills. Other people claim the flight path could have been made even if it would have meant a huge plane flying at high speeds just metres above the Pentagon lawn, something engineers suggest is impossible. Due to the US government refusing to release all CCTV and camera footage which may have caught the planes impact and put conspiracy theories to bed the Pentagon attack has been used by believers of the official story to beat many 911 Truthers over the head with. Many people see the Pentagon attack as a way to discredit the whole 911 Truth movement by claiming that they are ignoring physical evidence and witness accounts. If you can be dismissed at the Pentagon then your theories over the WTC and the whole event can be dismissed as well. Any talk of missiles, no planes, holograms, lasers from space or mini nukes are all used to label anyone who looks into the events of 9.11 as crazy. To the uninitiated it doesn't matter if any of these theories have merits or not because just hearing these theories can make the whole movement look like tinfoil hat wearing loons. Due to that, people unwilling to question their government can easily dismiss any uncomfortable facts. Therefore questions about the evidence regarding the Pentagon needs to be looked at and answered if possible. Hopefully these two videos which look at the witness evidence in detail and then a talk by an ex Government official who slots all the pieces together will help. The facts do not fit the evidence. The impact zone that is supposedly where Flight 77 hit the Pentagon does not fit the evidence for a number of reasons. 1. The supposed impact zone is the first two floors of a wedge of the building that would have been impossible for a huge Boeing 757 to hit at 400 mph. Not only could a plane not fly that fast and low to the ground without crashing first. The dimensions of the plane do not allow it to create such a small hole. Many pilots, aircraft specialists, engine designers have all gone on record to state that the downforce of a large plane flying that fast and low to the ground would mean it would have crashed way before the walls of the Pentagon. If that had happened the grass outside the impact zone would have been scorched and covered with debris. The whole plane would NOT have entered the walls of the building. 2. There is a lack of evidence outside this "official" impact zone. No big parts of nose cones, no huge multi-ton engines and no damage to the lawn in front of the damaged building. In fact the debris which was found was further along the building in front of a totally different wedge. This is explained later. 3. A plane is made from lightweight materials. It cannot punch its way through 3 rings of re-inforced concrete as it supposedly did at the Pentagon. The following video shows what happens when a plane going at the speed of 475 mph hits just one re-enforced concrete wall. Notice how the wall remains solid and the plane disappears into small pieces. This speed is basically the same speed as Flight 77 hit the Pentagon. This video is from an independent report by Citizen Investigation Team which uses data from the Pilots For 911Truth. A number of witnesses who claim to have the seen the plane fly in towards the Pentagon provide contradictory evidence to the official story. These are all people who have worked in the area of the Pentagon for years. Either Policemen, Arlington Cemetery workers or aircraft specialists from the Pentagon itself. -A north bound approach with the plane flying to the right (or over) the Navy Annex in a totally different manner to the official report which requires it to fly to the left of that building. -A slower speed of the plane. Not a fast 450 mph plane approach as the official story claims. -A plane that was wobbling, "banking" and correcting its angle - not a direct, fast, straight trajectory. -All of these witnesses whilst in positions to see the plane come in admit they couldn't see the impact. Most were running away from the direction of the planes impact, covered their heads or were not in a position to see the impact. -All have refused to change their testimony since it has been revealed to them that it directly contradicts the official story and whilst many now refuse to give further interviews they claim their story is correct. -The one piece of evidence which corroborates the official story is the testimony of a taxi driver, Lloyd England, who claims to have been hit by the tall light pole that was supposedly bent by the plane as it flew the official trajectory. However leaving aside the fact that a 450 mph plane hitting a goose or bird can cause a crash, let alone a large metal pole, the witness when confronted with his evidence and how it contradicts all other witness accounts tries to change his story to make it fit with the other witnesses. He is also caught off tape many times making contradictory statements to the location of his taxi in direct conflict with the physical evidence and photographs which prove his exact location on the day. "It has nothing to do with the truth it's his story"
"This is too big for me man this is a big thing"
"Man you know this is a world thing happening. I'm a small man." "I'm not supposed to be involved in this.".... "This is for other people, people who have money and all this kind of stuff." "I'm not supposed to be involved in this, I have nothing." He seems to be alluding to be part of a story he has no control over, "a small man in a rich mans story" and he seems to admit to being part of a "story" to make the official story fit the facts. His wife also works for the FBI, although whether that has any importance I do not know. The conclusion of the documentary is that the plane the witnesses saw didn't hit the Pentagon. The witnesses who saw the incoming plane should be believed in that the planes trajectory was wildly different to the official story and that because they couldn't see the planes impact that it flew over the Pentagon. This conclusion would fit with the official analysis of the flight data recorder from Flight 77 which shows a discrepancy between the altitude of the plane and the official story. For this plane to have to have hit the lamp-post which Lloyd England claims happened the plane would have had to have been 440 feet high! This is obviously an impossibility. What is clear from this documentary and the witness statements is that the official story doesn't even fit with the witness statements who are on record seeing a plane fly towards the Pentagon. 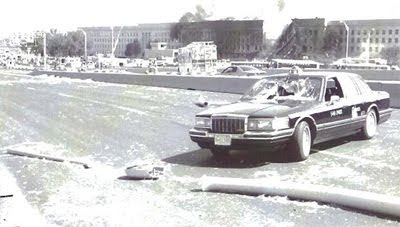 This talk from an ex Reagan administration official, Barbara Honegger, puts the pieces together meticulously in this talk to explain how the witnesses are right, the hole without debris is also correct and that a plane DID hit the Pentagon. An overview is this: 1. A plane, probably a drone painted in American Airlines colours, did fly into the Pentagon but it flew in the trajectory that the witnesses in the Citizen Investigation Team documentary claimed. 2. The drone was either destroyed before impact or hit the Pentagon causing all the debris that was found near the Heliport terminal. Remember this is NOT the official impact zone which is many yards around the building. 3. The official impact zone was caused by explosives inside the building. This explains why there is no debris outside on the grass. No debris found inside and why witnesses who walked through the hole to safety claimed to see no evidence of a plane. 4. This second explosion WAS reported on TV, by witnesses and Pentagon employees. The official story had to make this second explosion the plane impact even though the timings were out and the flight path didn't match with the witnesses. However there is no logical or physical way the damage from this second explosion could have been caused by a huge Boeing 757 flying 400+ mph into the first floor of the Pentagon. 5. Therefore the cover-up involved making this 2nd impact zone the official entry point for the plane even though a plane could never punch its way through 3 huge concrete walls as the video above shows. 6. This also explains perfectly how witnesses saw a plane hit the building, how other witnesses could claim to see no evidence of a plane at the impact zone and why people claim to have seen debris and others NO debris. There were TWO impact zones. One from a plane (drone) and one from an explosion. Watch the video below to see how she puts all the pieces together and provides the reason for the attack. Without it, no declaration of war could be made which meant that the Pentagon attack WAS the main attack on 9.11. As she points out, it was George W Bush himself that said that it wasn't until he saw the Pentagon attack that he realised the country was really at war.